While the commercials aren’t wrong, their method of advertising certainly is. Your credit is a vital part of your personal financial life and you should definitely check it regularly — but nothing free should ever require you to enter payment information. You should always consider it a red flag when a company advertising a free product requires you to give your credit card number. Instead, find an actually free free offer to keep tabs on your credit. With a little bit of research, it’s easy to keep track of your credit without ever needing a credit card. Of course, before you go haring off to sign up for the first free site you see, it’s a good idea to get familiar with the different aspects of your credit. To start, one of the most important distinctions to make when it comes to credit is the one between your credit report and your credit score — which are not the same thing. For over 100 years, consumer reporting agencies have been collecting, compiling, and analyzing data on the masses. It wasn’t until 1970’s Fair Credit Reporting Act (FCRA), arguably one of the most important pieces of consumer finance legislation ever passed, that consumers gained legal access to the information collected about them in reporting agency files. Called your consumer credit report, or credit history, the information collected by the credit bureaus is the basis of your personal credit. Your credit report is used by a variety of important decision-makers in your life, including many potential employers, landlords, and lenders. The information in your credit report is also used when bureaus and lenders calculate your credit score. Your three-digit credit score is essentially a snapshot of your potential credit risk and can be a good way to monitor overall credit health. The biggest credit scoring agency is the Fair Isaac Corporation (FICO), which supplies credit scores for most of the lending industry. Another important thing to note is that each of us has more than one credit report. 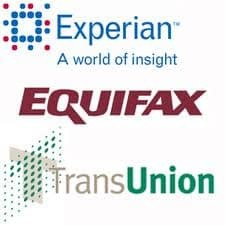 In consumer credit, the three most important credit bureaus are Equifax, Experian, and TransUnion, and you have a different and unique credit report for each credit bureau. Depending on the reporting behavior of your creditors, the information on your credit reports may vary by bureau. For instance, if your credit card company only reports to Equifax and TransUnion, the credit card account won’t show up on your Experian credit report. Because of this inconsistency (and small variations in the way the bureaus process and store data), your credit score — which is based on your credit report — will also vary based on which bureau supplied the data. When checking your credit online, it’s important to note which bureau supplied the credit report and score information. Getting reports from each consumer reporting agency will give you a complete picture of your credit. All consumers are legally entitled to one free copy of their credit report each year from each bureau. This is thanks to the Fair and Accurate Credit Transactions Act (FACTA), an FCRA amendment passed in 2003. In response, the major bureaus created AnnualCreditReport.com, where individuals can go to request their free annual credit reports from each bureau. The last key piece of information to keep in mind when comparing credit checking sites is the type of score they provide. In addition to your scores varying based on the credit bureau that supplied the data, your credit score will also change depending on which credit scoring model was used to calculate it. The most frequently used scoring models are those developed by FICO, which itself uses more than two dozen different models when calculating scores. In general, the FICO Score 8 is the most commonly used score, though the auto and credit card industries use industry-specific scores such as the FICO Auto Score 8 and the FICO Bankcard Score 8, respectively. In general, free credit score offers providing a true FICO credit score will only provide your FICO Score 8 from a single credit bureau. The only way to receive all of your FICO scores, including the industry-specific scores and variations for each credit bureau, is to purchase them directly from FICO through myFICO.com. 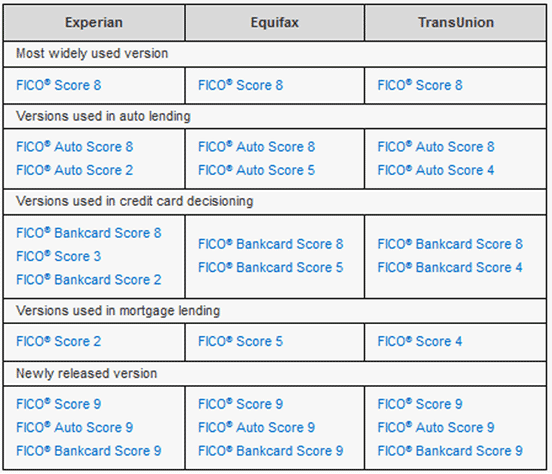 This table from myFICO shows the various FICO models used to generate consumer credit scores. For the most part, the free credit scores you’ll receive from online companies will not actually be FICO scores of any type. Instead, the average free offer will provide a credit score based on the VantageScore 3.0 model, which was created by the three major credit bureaus to create a more consistent score. The VantageScore model uses many of the same credit factors to calculate your score as the FICO model, but your FICO and VantageScore credit scores are unlikely to be exactly the same. A VantageScore generated credit score is still a good indication of your overall credit health. In some cases, you may also come across an entirely different credit score type, based on a scoring model from a third-party or small scoring agency. Often referred to as educational credit scores, these scores are rarely used by lenders but, if based on your credit report data, can still be a good way to get a feel for your credit situation. All of the companies on our list are actually free — and that means credit-card-free, too. While a few of our picks may offer some paid products, none of them require a paid membership to access your free score. Each site on the list offers a totally free credit score from at least one credit bureau, and many of them also provide your credit report for free. To get the most accurate and complete picture of your credit, you may want to consider signing up for multiple sites; with the right combination of free offers you could end up with reports and scores from all three major bureaus without spending a dime. Likely the most recognizable on the list, Credit Karma was founded in 2007 with the mission to help consumers feel more confident about their finances. The site uses affiliate advertising to keep its services free, meaning when you purchase a product recommended to you by Credit Karma, the site receives a commission from the product seller. 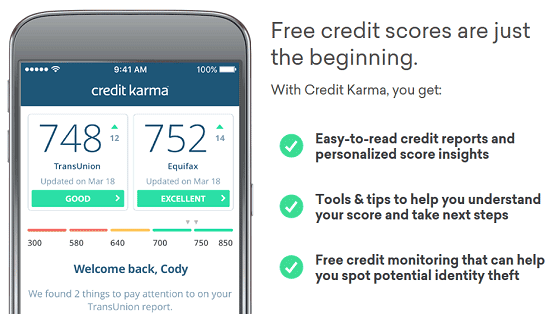 Credit Karma offers free credit scores and reports based on both TransUnion and Equifax bureau data. Credit Karma users can access both their TransUnion and Equifax credit reports through the site complete with credit monitoring that alerts them to changes. Users can also track their credit scores for each bureau, calculated using the VantageScore 3.0 model. Credit Karma reports and scores can be updated weekly and never impact your credit. In addition, everything can be accessed through the Credit Karma mobile app wherever you are. NerdWallet users get a credit report and score based on TransUnion data and the VantageScore 3.0 model. Users who sign up for NerdWallet will receive free access to their TransUnion credit report and credit score, updated weekly. As with Credit Karma, NerdWallet credit scores are calculated using the VantageScore 3.0 model. The site also offers free credit monitoring with alerts, as well as credit score goals and a credit simulator to make it easy to stay on track. While the sites on the rest of the list are made up of third-party companies, FreeCreditScore.com is actually owned and operated by Experian, one of the three major US consumer credit bureaus. Through FreeCreditScore.com, users can sign up for a free Experian Membership, no credit card or payment information required. 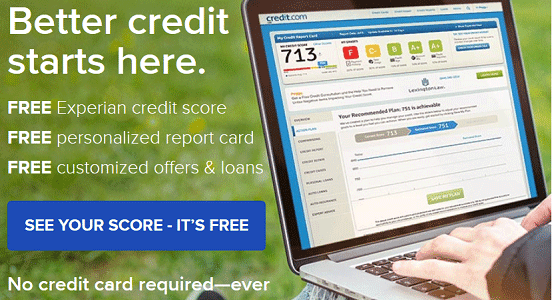 FreeCreditScore.com is owned and operated by Experian, one of the three major credit bureaus. Your Experian Membership comes with a free Experian credit report and free credit monitoring alerts. It will also provide a free credit score, updated every 30 days on sign-in. FreeCreditScore.com is the only one on the list that offers a legitimate FICO score, calculated using Experian data according to the FICO Score 8 credit model. Founded in 2008 to increase credit awareness, Quizzle was acquired by popular personal finance site Bankrate in 2015. Where most of the sites on the list use affiliate relationships to pay for the free services they offer, Quizzle provides its free score and report as the starter package for their more advanced paid features. Bankrate subsidiary Quizzle’s free credit score is based on TransUnion credit bureau data. While users won’t need to use a credit card to access the free offerings, many of the neater tools, such as the credit timeline, will require purchasing a paid package. Quizzle offers credit reports from TransUnion, as well as VantageScore 3.0 credit scores based on TransUnion credit report data. The free package allows users to access an updated report and score every three months. A segment of the major financial technology company, Inuit, Mint offers free credit scores as part of its bill tracking and budgeting package. The services are completely free and can be accessed through the website and mobile application. Mint stands out from the others on the list as the only company offering a free credit score calculated using a proprietary Equifax scoring model. 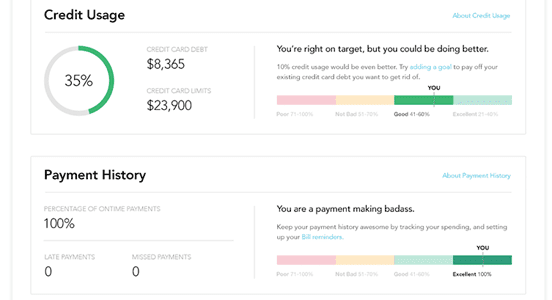 Mint offers users a free credit score and report summary based on Equifax data. According to the site, “The credit score provided under the offers described here use the Equifax Credit Score, which is a proprietary credit model developed by Equifax. The Equifax Credit Score is intended for your own educational use.” In addition to your Equifax Credit Score, Mint also provides a credit report summary based on your Equifax credit report. While not your complete report, the summary can be a good way to get a snapshot of your credit. Scores and report summaries are updated once a month. Credit Sesame was founded in 2010 as a source for consumer credit tools and information. As with many of the others on the list, Credit Sesame is able to provide free services through affiliate partnerships that provide a commission when users purchase products recommended to them by the site. Free credit score and credit report cards from Credit Sesame use TransUnion data. 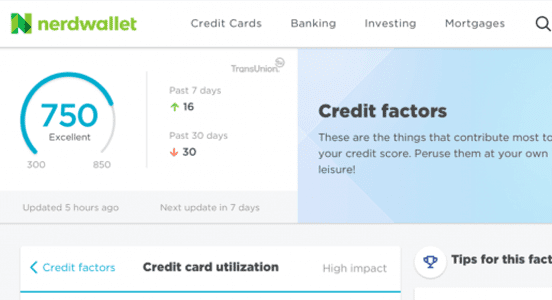 Also similar to some of the other picks, Credit Sesame uses TransUnion data to provide its free monthly credit score and credit report card. The site also offers free credit monitoring and alerts, to track changes to your TransUnion credit report. Possibly the oldest on the list, Credit.com was started in 1995 to provide expert information about credit. Using similar affiliate income as other sites, Credit.com offers users free credit scores and report cards as well as other products. 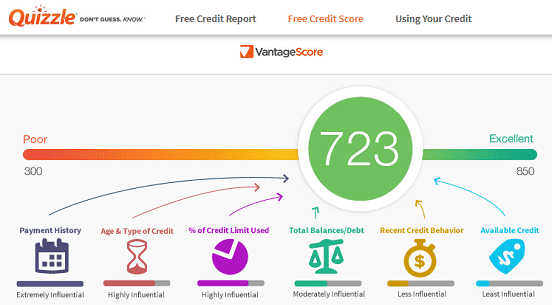 Credit.com scores use the VantageScore 3.0 model and Experian credit data. While the credit score provided by Credit.com is calculated using the VantageScore 3.0 model used by many others on the list, the site doesn’t actually base that score on your TransUnion data. Instead, Credit.com uses your Experian credit report to provide your free credit score and credit report card. At the end of the day, you may not want to discount your credit card entirely when it comes to getting a free credit score. One of the latest trends in credit card perks is actually to provide you with a free monthly credit score on your credit card statement. This sweet perk isn’t limited to top-tier cards, either. A variety of subprime issuers offer solid credit cards with free credit scores. While credit cards offering free credit scores can be a great way to monitor your overall credit health, they won’t actually provide your full credit report. Make sure to also check your three credit reports at least once a year. Given the huge number of credit score types and variations, it can often be quite difficult to decipher your free score — especially if you get more than one. Depending on the source of the data and the model used, you may see a lot of very different values. When it comes to decoding your score, there is really just one basic rule: the higher, the better. The FICO Score and VantageScore 3.0 credit score ranges go from 300 to 850, with 850 indicating the best credit score — and, therefore, the lowest credit risk. 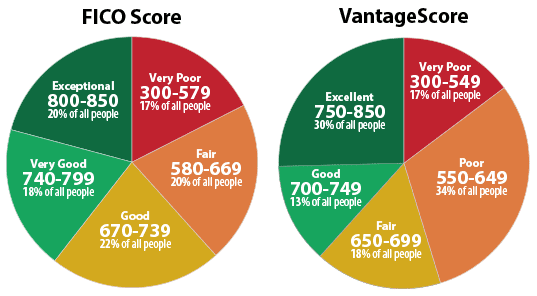 Both VantageScore and FICO Score models use a 300 to 350 range for credit scores. Typically, those who have credit scores above 700 are considered to have good credit. If your credit score is below 500, you are considered to have bad credit and may have trouble applying for new lines of credit. Higher credit scores indicate you are a more responsible borrower, which will net you the best interest rates and loan terms when you apply for new lines of credit. If you check your free credit score and are shocked by a lower number than you expected, you definitely need to take a look at your credit reports. Because most scores are based on the information in at least one of your credit reports, a low score can indicate trouble on your report. Negative marks, such as late loan payments or missed credit card bills, can drag down your credit score. That said, even those with perfect credit histories can be surprised by a low credit score if they haven’t been regularly checking their credit reports. No matter how well-organized the credit bureau — or creditor reporting to them — mistakes are going to happen. Anything from a misspelled name to an expired account can cause problems with your credit report and, thus, your score. One of the easiest ways to address errors on your credit report is through the use of a reputable credit repair company. The experts at a credit repair company can not only find and fix the big mistakes, but may be able to remove other troublesome accounts with unverifiable or fraudulent information. Click here for sign-up form, terms, and details. When comparing credit repair companies, be sure to do your research. Look into the company’s reputation with the Better Business Bureau and/or Consumer Affairs, and thoroughly investigate their company website for any warning signs. Also, make sure you know exactly what to expect from the process; credit repair is designed to address specific types of issues. Lastly, keep in mind that credit repair is not an instant fix and may take up to several months to be effective. No Matter Which Method You Pick — Check Your Credit! Although most of us can’t stand those pesky commercials, they do occasionally get something right. In particular, the seemingly endless stream of companies harping on you to check your credit have the right idea. Regardless of the method or company you choose to use, you should check your credit reports and scores on a regular basis to ensure you maintain a healthy credit history.